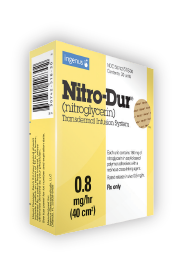 MANAGING YOUR CARDIAC HEALTH WITH NITRO-DUR? Meet your new healthcare partner… Ingenus. As a Nitro-Dur patient, you’ve come to expect life-changing medication and world-class support. At Ingenus, we’re dedicated to continuing that tradition. Don’t worry. Nothing has changed except for who is delivering your medicine. Nitro-Dur will now be brought to market by one of the nation’s most trusted pharmaceutical companies with a passion for quality and patient care. Allow us to introduce you to the Ingenus difference. Get to know us (and your medicine) better at www.ingenus.com. *If you have questions about your medicine or need to report an adverse event, please call Ingenus at 877-748-1970.